You use the term “secret” but “each secret has an emitter and a receiver, meaning someone who the secret is meant for but who mustn’t know it.” Who is the receiver in this case? Who do you let in on the secret and whom do you exclude? 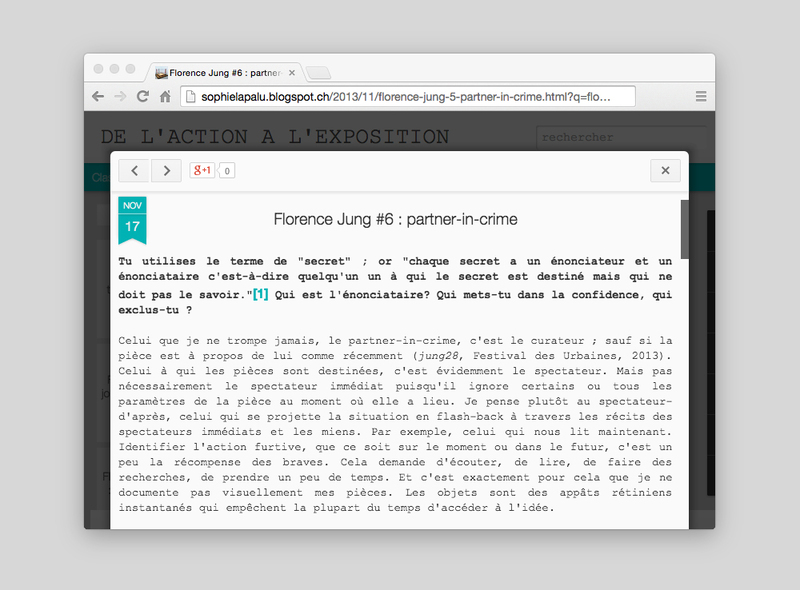 The person whom I never deceive and who is my partner in crime is the curator; unless the piece is about them like my recent ‘jung28’ (Festival des Urbaines, 2013). As for whom the pieces are meant for, they’re obviously for the audience. But not necessarily the immediate audience since they’re not always aware of all the elements of the piece right as it’s happening. I’m thinking more of the later audience, the ones who think about the situation in a flashback through viewer accounts and my own comments. For example, the people who are reading this interview. Being able to identify the covert operation, whether it’s in the moment or later on, is sort of the reward for the intrepid viewer. To figure it out, you need to listen, read, do some research. It takes time. And that’s exactly why I don’t record my pieces. Objects, including pictures and videos, are the baits that usually prevent people from being able to access the idea. FLORENCE JUNG is a French artist based in Switzerland whose work blurs the line between constructs and accidents, rather than to say reality and fiction. Her work is difficult to define in fact: she primarily constructs situations which are mediated through the best medium she found to grab the complexity, and which is often performance. Her pieces are like narrative with consequences; narratives which encourage the viewer to question preconceived ideas of certainty and truth.